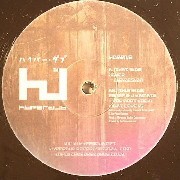 2009 finds Hyperdub marking their fifth anniversary, and the first of many astonishing outings lined up to celebrate the half-decade is delivered by prodigious Bristolian synth wizard Joker, dropping his debut release on the label, backed by the talk-box sleeze of Danish producers 2000F & J Kamata. This new equal-front-side12” is yet another in Hyperdub’s series of tunes putting the fun firmly back into synthesizers. Already well known for bombs like ‘Gullybrook Lane’, ‘Hollybrook Park’ and his recent epic ‘Play Doe’ with Rustie, Joker’s ‘Digidesign’ staggers in with a laid back groove and twisted bass synth, but it’s all about the infectious melody in the middle. On the flip, 2000f & J Kamata’s muchanticipated ‘You Don’t Know What Love Is’ opens up a 1985 vintage can of robofunk R&B earworms that will eat your audio nerves alive. The words ‘dubstep’ and ‘wonky’ were not harmed in the writing of these sales notes.